Lee el pronóstico del tiempo en el periódico. Escribe el pronóstico del tiempo de tu país o región en nuestro blog. Lee el pronóstico del tiempo del periódico. You can expect rain and cooler temperatures today in the Northeast with highs in the upper 60s. In the Southeast there might be tornados, so watch out. In the Midwest there is a 70% chance of thunderstorms. In the South it'll be hot and sunny. In the Northwest they're expecting snow and cooler temperatures today. In the North it'll be windy again today with extremely cold temperatures. 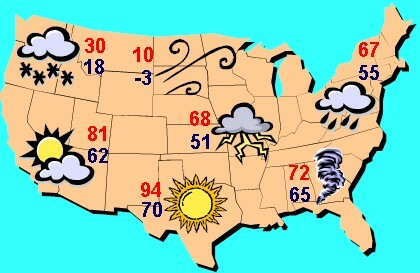 In the Southwest it'll be party cloudy and warmer today. Expect flight delays in the midwest due to the storms rolling into the area this afternoon. The Miami airport will be closed because of high winds and the possibility of tornados. Be careful if you're driving in the Northwest because roads have been very icy. If you fly into Chicago's O'Hare airport, plan some extra time to find your gate. They're renovating Terminals 1 and 2. The News Gazette newspaper is sponsoring a weather trivia contest. We'll print the answer in tomorrow's weather page. Selecciona la descripción del tiempo en cada región basada en el mapa. Do you know what the answer to the trivia question is? Escribe el pronóstico del tiempo de tu país o región. Escribe la "Lección Escrita" en la sección para comentarios abajo. Inglés Mundial es una comunidad de personas que quieren aprender inglés gratis. Ayúdense unos a otros y si ven un error en la escritura de otro, respondan con la corrección. Para aprender de errores comunes, sigue la página de Inglés Mundial en Facebook, Google+, o Twitter.